In the spring of 1998, I was watching the news from a Columbus Georgia television station. I was only half listening to a report about the restoration of Jimmy Carter's boyhood home. At the end of the segment, the reporter said that Park Service workers are interested in contacting someone who knows about old windmills. Did she say "old windmills"? I called the station and asked someone there if that was what the reporter had said. They put the reporter on the phone and she said that indeed, an archaeologist working with the Park Service wants to talk to someone about old windmills. The archaeologist and I were soon in contact and he sent me a package of maps, photos and aerial photos. He was very determined to find the exact location of the old windmill which was once next to the boyhood home of Jimmy Carter. The pictures he sent me of the site clearly showed the well with an old pump jack sitting on a slab. What is the problem, I wondered? The pump is most likely on the same well as the windmill site and the aerial photo showed only one well site. It is only about an hour and twenty minute drive from our house in Opelika Alabama to Plains Georgia. Actually, the Jimmy Carter boyhood home is in a tiny community a few miles from Plains called Archery. The archeologist was gone from the site when we found the time to drive over there but he assigned a ranger to show us around. We met at the old Plains High School which is also restored to the time of Jimmy Carter's boyhood and the school serves as a sort of headquarters for the Plains tourist industry. 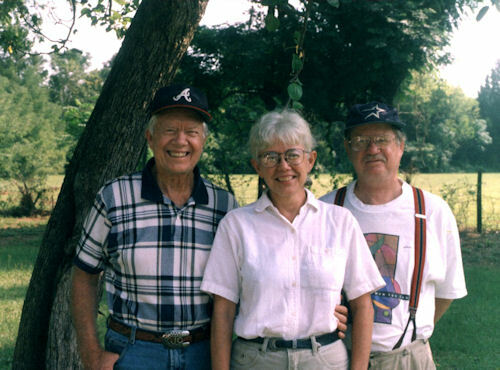 When I met up with the ranger, she handed me a photograph of Jimmy Carter and his sister taken when they were very young. Behind them in the picture was the windmill. I was very surprised to see that it was a very tall tower and was what is called an urban rig; the water tank is mounted in the windmill tower instead of being in a separate tower. Fortunately, we do not have to look for more anchors for a water tower. Unfortunately, the top of the photo cuts just below the motor of the mill and does not show the tail at all. Seeing the shape of the tail or the silhouette of the motor hood would have been great evidence in determining the make of the windmill. The ranger led us out to Archery where the restoration work was going on and I got to examine the well site first hand. There was a concrete slab on which sat an old pump jack still attached to a rod going down into the 2 or 2.5 inch pipe going down into the well. I immediately spotted some pipe and rods lying by a fence a short distance away. There was still a cylinder on the end of one of the pipes. This had obviously come out of the well and had been lying there for some time. Looking at this, I could tell how deep the well was. The old pump jack (I can not remember the brand name) was precisely the type that was used to replace a windmill. When the Rural Electric Authority brought electricity to remote areas of America in the 1930's, people replaced their windmills with this type of pump jack because it could be adjusted to have the same vertical stroke as the windmill. Thus the pipe and rods were left in place and the windmill was simply replaced with this jack which was powered by an electric motor. And, by the way, the Jimmy Carter Boyhood Home was being restored to the way it was in 1937, the year that electricity came to the area. As far as I was concerned, the question of the location of the windmill was completely determined. I told all of this to the archeologist by e-mail but his job was to get the physical evidence of the presence of the windmill and so he was determined to find the "footings". Windmills do not have footings like buildings do. I explained to him about how windmills are anchored and sent a photo or drawing of a typical anchor. It is made of angle steel, about six feet long, is t-shaped and will be set in concrete. I thought that they were probably cut off under the surface but he might find them with a metal detector. I was surprised when I heard back that the anchors were found only after digging down a few feet. At some point, when the windmill was sold, someone had gone to the trouble of digging down to the foot of the anchors before cutting them off. The anchors, what was left of them, were as I described and were where I said they should be. My archeologist friend, whom I still had not met in person, was quite pleased and grateful for my assistance. I thought that I was through with my volunteer effort and I was glad to be of some help for a good cause. Later, I received another e-mail from the archeologist in which he urged me to visit the site again. He wanted to talk to me in person about the windmill. There were some more questions about it. We were going to the Saint Louis area to meet some friends. Plains was definitely not on the way to Saint Louis but I gathered up my copy of the old windmill picture, some material about windmills in general and headed out for Plains on an early Monday morning. We were supposed to meet him at the site at a certain time but we were about twenty minutes late. We drove up and saw that there were people standing around the well site including several teenagers. We approached the group and recognized only one person, the former president of the United States, Jimmy Carter. I learned later that he had been waiting there for a while to talk to me (me!). The archeologist explained later that he had attended Mr. Carter's Sunday school class the day before to get the chance to ask him to come to the site to talk to an expert on windmills. Introductions were made and as we shook hands with Mr. Carter, he commented to me about the Houston Astros cap that I was wearing. He was wearing an Atlanta Braves cap and at that time, late in the summer, it appeared that the Astros and Braves were headed for a confrontation in the playoffs. At the end of the baseball discussion, he asked me about why I should know about windmills. I explained that I grew up in West Texas, my father was in the windmill business and I traveled all over West Texas helping him work on windmills. I said "I helped him until I was off to college". Then as an afterthought, I said "And that is why I was off to college". Mr. Carter enjoyed that remark. He laughed and motioned to our surroundings and said that this farm is the reason that he was off to college. He turned his attention to the group of teenagers who were there to help with some volunteer work. I had no idea that I would be talking to the former president that morning and I was a little overawed but I did manage to think up a few questions to ask him about the old windmill. After he finished with the young volunteers, I got a chance to ask my questions. At that time, the only real concern had been about the location of the windmill - not the make of the windmill. He did not remember the make but thought that it was probably bought at Sears. If so, that would have made it a Monitor brand. He remembered climbing up the tower to grease the windmill - not pour motor oil into it. That would eliminate a lot of other brands but I would have to do some research on that. Mr. Carter was genuinely courteous and friendly and he offered to give us and a few other folks a personal tour of the house that he grew up in. He took us through the house and told stories about things he remembered associated with each room. I remembered that the shower had no hot water - just water piped directly from the water tank. We agreed that the shower must have been a very cold daily ritual. He showed us a concrete object which had his brother Billy's initials in it. At the end of the tour, he was on his way back to his car and he asked us if we had a camera. I went to our car and got it. A Secret Serviceman or Park Ranger took our picture together. I also had him sign my copy of the picture of the old windmill with him and his sister standing in front of it. He handed me the ball point pen to keep. In the fall of 2000, I got an invitation to attend the inauguration of the Jimmy Carter Boyhood Home. I really wanted to go but we were too busy building our house in San Marcos Texas. There are several sites on the internet where you can see pictures of the Jimmy Carter boyhood home including pictures of the windmill. Search for "jimmy carter boyhood home" and look around.